We’d love your help. Let us know what’s wrong with this preview of Secret Sauce by Harry Mills. When it comes to messaging, what worked in the past won’t work today. Our noisy, digital world has undermined our ability to focus. For a message to grab attention and persuade, it now has to pass the SAUCE test and be: Simple, Appealing, Unexpected, Credible, and Emotional. 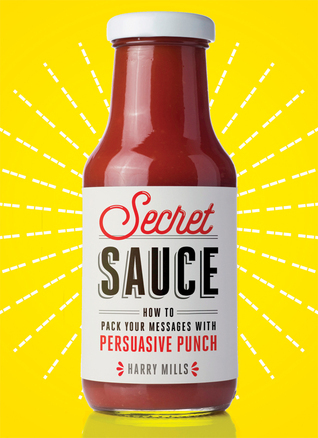 Secret Sauce shows you how to transform unconvincing messages into compelling copy. It comes with a When it comes to messaging, what worked in the past won’t work today. Our noisy, digital world has undermined our ability to focus. To ask other readers questions about Secret Sauce, please sign up. The first chapter is basically wasted by outlining what we already know to justify the need for the secret sauce. Problem is, if you use this secret sauce, you will feed into the vicious cycle of the short attention span. I also find it ironic that the author tried to explain the hitchhiker ad (and other examples throughout the book) without the use of a visual. So much for eating your own dog food. In the end, this book is like an aggregator of opinions, citing extensively the findings from many o The first chapter is basically wasted by outlining what we already know to justify the need for the secret sauce. In the end, this book is like an aggregator of opinions, citing extensively the findings from many other books and studies. Nothing wrong with that per se, but when you're reading a book with "Secret" in its title, you would expect a lot more originality. HARRY MILLS is founder and CEO of Aha! Advantage, an international consulting and training firm whose clients include Unilever, IBM, Toyota, Oracle, and Astra Zeneca. An in-demand speaker, he is the persuasion expert at Harvard Business Review’s Manage/Mentor program and author of Artful Persuasion, The Rainmaker’s Toolkit, and other notable books.